The problem "startup disk is full on mac" is all too common for Mac users. Even if you buy a Mac with a 750GB hard disk, you can run out of the Mac space quickly with lots of media files such as movies, music and photos. Worse still, iTunes or Photo library can quickly fill up the 64GB or 128GB SSD of Macbook Pro/Air, leaving little room for anything else. It's awfully terrible to have low space on Mac, and you'll get crazy when your Mac runs slowly. So how to free up space on MacOS? Here are 10 quick tips to clean up gigabytes of disk space on Macbook Pro, Macbook Air and iMac, iMac Pro. MacX MediaTrans is the best alternative to iTunes that can backup music, photos and videos from iPhone iPad to Mac (macOS Sierra/High Sierra incl. ), and reversely. No longer worry about taking too much space on Macbook Pro/Air, iMac. 1. 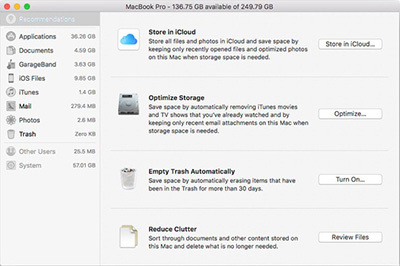 Check the used/available disk space - Click the Apple menu > Select "About This Mac" > Click on the "More Info" button > Choose the "Storage" tab to check the disk storage overview and capacity. 2. Backup important or useful files - We cannot rule out the possibility that you need to delete files to clean up disk space on Mac. So you'd better backup important and useful files before Mac disc cleanup. 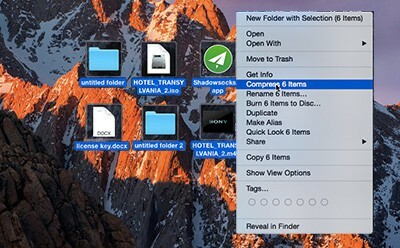 Then follow tips below to figure out how to win back some storage space on Mac. If you have upgraded to macOS Sierra or got a macOS High Sierra update, you may notice a small feature of it – "When you need more space, let your Mac find it for you". The new macOS Sierra/High Sierra will help you clear out duplicates, app installers and other superfluous stuff, which could solve Mac startup disk full problem very well. 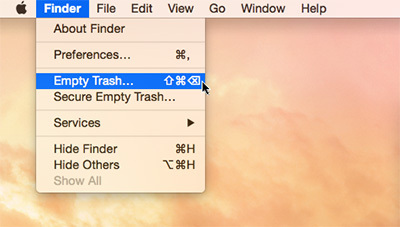 Just go to the menu and choose "About This Mac" and then flip over to the Storage tab. Once you are there, you can go through the settings to clean out iTunes movies and shows, find large files, set the trash to empty automatically every 30 days, and a number of other settings. By the way, the Mac disk cleanup will speed up MacOS Sierra or macOS High Sierra as well in return. Actually every time you synced your iPhone iPad iPod with iTunes, it automatically backs up specific files and settings to your Mac, which will take up too much space on your Mac computer. So if you wanna clean up Mac disk space, you can delete your old iDevices backups. 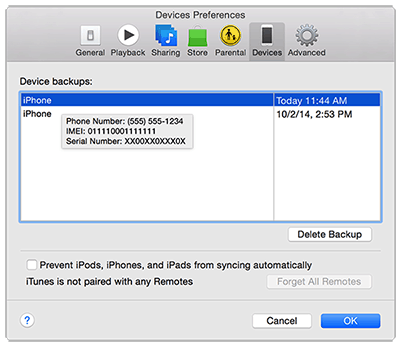 You are suggested to keep the most recent backups of your iPhone iPad iPod and delete the older ones. Find them: Home > Library > Application Support > MobileSync > Backup. Delete them within following steps: Choose iTunes > Preferences > Click Devices > Select the backup you want to remove > Click Delete Backup. Note: If you do not want to have too many backups on your Mac computer daily, you can switch to an iTunes alternative to backup iPhone to Mac. 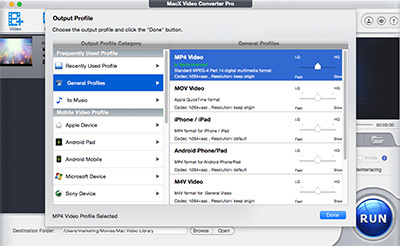 MacX MediaTrans is a nice choice, which transfers iPhone iPad iPod to Mac without duplication. And surely it won't take up too much disk space on your Mac computer. MacX MediaTrans, a professional iOS transfer to backup your iPhone iPad iPod to Macbook Pro/Air, and iMac without any duplication. Thus there is no worry about your backups took too much space on Mac, reducing the demands of freeing up disk space on Mac computer. Applications occupy disk space of Mac of course. But are you sure you used all applications installed on your Mac? I guess there must be some of rarely-used. You can uninstall apps like Pokemon Go, Super Mario Run etc. you got from Mac App Store or other websites to free up disk space of Mac. And there are still some other barely used apps belongs to Mac OS X, which is unable to install. 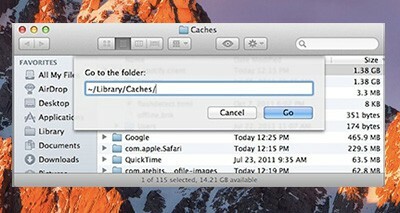 But you are clear the caches of these apps for more space reserved on Mac. Uninstall unused apps: Click the Launchpad icon in the Dock, hold down an app's icon until all the icons begin to jiggle, then click an app's delete button . If you later want the app, you can re-install it from the Mac App Store. iTunes has grown from a humble MP3 manager to massive application which handles music, movies, TV shows, podcasts, audiobooks, and iOS apps these years, which can take tons of GB. We benefit a lot from iTunes, but it does become the single largest consumer of your Mac's precious storage space. So removing unnecessary media files that take up the most space on your Mac seems to be effective to make more space on Mac. 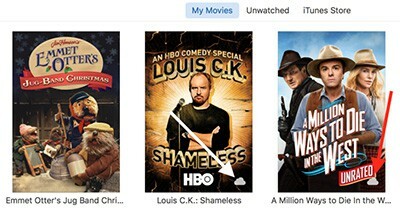 Check your current storage situation by launching iTunes and selecting a media type - movies, TV shows, music, etc. Take "Movies" as an example, you can delete the movies without a cloud icon on the lower-right corner, which tells you the movie is local rather than purchased or movies transferred from iPhone to Mac in the cloud. There are always some files are essential but in big size. They take up too much space, but you cannot delete them. How t free up space on Mac in this situation? Never mind, you can compress the large files to smaller size in .zip, .rar, .mp4 etc. Generally speaking, a zip file will be about 10% smaller than all of the files were before they were compressed, this feature works best with medium size files. And a mp4 video is smaller than mkv, m2ts, avi formatted video, not to mention you can also compress UHD 4K to 1080P, 720P, 480P, 360P resolution. 1. Select multiple files and folders by holding down the Shift key (for multiple items) or the Command key (for several individual items) and clicking. 2. Right click the files and folders, choose "Compress Items" and a compressed file with the .zip extension will be created. And you can delete the original files and folders. Powerful Mac video converter can do you a favor on converting and compress videos to MP4 for smaller size. And MacX Video Converter Pro is the one to help you free up disk space on Mac by converting videos to MP4 or other smaller size formats as well as compressing MP4 video file size. Free download the MP4 video converter and launch it > Load the target big size video > Choose MP4 as the output format > Decrease resolution (optional) > Click "RUN" to compress video to MP4. Your Mac's hard drive probably has temporary files you don't need. These files often take up disk space for no good reason. When you are struggle on how to free up space on Mac, you are suggest to clear temporary files such as browsers caches, internet history cookies, download history and so on. Meanwhile, you can also quit the running applications to release Mac hard drive space since Apps like Safari, Chrome, Firefox, Photoshop, Spotify, and many others, create temporary cache files while they're in use. The Downloads folder is notorious for growing gigantic when left unchecked for a while. It's the default location for all of the files you download in Safari, Chrome, or Firefox, but thanks to the way that these browsers can automatically open or launch files once they're downloaded, many users build up a huge pile of old and unneeded junk in this folder. To free up drive space on your Macbok Air/Pro, iMac, you can go Downloads directory and sort by file size, then delete anything (everything) you don't need any more. BTW, if you have a good habit that once you install an app, delete the installer .DMG file, zip file, or archive it came from, you will not be rarely be bothered with how to free up space on Mac. As one of the computer giants, Macs are worldwide popular, which has been sold in more than 100 countries around the world with different languages. Almost every Mac application comes with several language files it supports so that it satisfies all almost all its users. But the fact is that you only need one or several languages indeed. So removing unused languages is another way to free up disc space on your mac's hard drive. 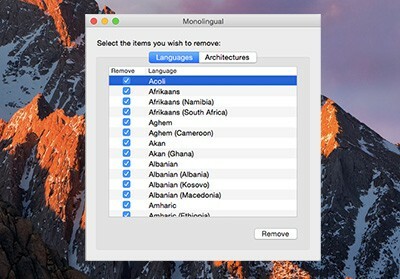 You can used Monolingual to remove those language files for Mac disk cleanup. Actually it does help you on freeing up drive space, but not suggested. If you have a big hard disk with more than enough free space, just keep them for the possibility of future use. If it's been a while since you restarted your Mac, sometimes doing so will reclaim a bit of space, as the macOS reboot process involves clearing certain cache and temporary files which may have accumulated in the days and weeks since your last reboot. Of course, you'll do that under the Apple Menu at the top-left of your screen. Or if you have downloaded System Updates but haven't install it yet, rebooting the Mac will find out the wasted sizable gigabytes space the System Updates occupied and install it to free up drive space on Mac. No matter which approach you take to free up space on your Mac, keep in mind that you should always make sure that your backups are solid before getting started. And DO NOT delete anything if you don't know what it is. The effective solution of "How to free up extra hard drive space on Mac" is definitely not to delete stuff in System folder, all right? Your Mac runs slow after years of uses. 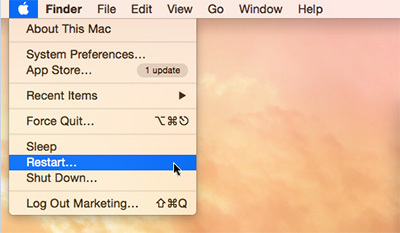 But you can speed up your Mac with faster performance by following the tips below. This page centers on the must-have apps for Mac in order to make full use of your macOS computer. Welcome to the macOS Sierra vs Mac El Capitan comparison review, in which you can know which is the best Mac OS for you. MacX Video Converter Pro is an all-in-one Mac OS X video converting program with top quality and fast speed. This feature-rich video converter can help you easily convert HD or SD videos to MacBook Air/Pro/iMac with Mac OS X 10.12.